SAVE 50% on Clearance Gel! A remarkeable 250 watt LED followspot also available in a RGBW version. 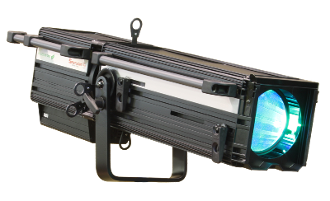 Produces a beam of white light with all of the traditional attributes of a followspot including iris, zoom, and color boomerang. Additionally the FollowLED includes shutters! CRI of 95. Powercon In- Out. DMX-RDM. Easily mounts to pipe or truss with a half coupler. Stand sold separately. Copyright © 2019 StageLight Inc. All rights reserved.